Something continues to grow in the Abyss, a new power, once which the elder Demon Lords do not seem to comprehend. In the twisting tumult, it infests one plane after another, slowly gaining a foothold in many places before it reveals itself. The first hints of it were seen in The Jungle Of Gears, and a second stronghold has now been documented — the winding passages of the Clockwork Hive. The powers of the Abyss are often renowned for their madness, their cruelty, and their power, but rarely for their creativity. Creation is, after all, antithetical to their goals of reducing the entire universe to rubble. So it is hardly surprising that they are skilled imitators — distorters and mockers, really — but poor at actually making something original. (Most of the Abyss is shaped by the cumulative psychic energy of uncounted trillions of sapient beings from across multiple realities, their darkest visions and greatest fears giving shape to the chaoplasm.) Given the existence of beings which embodied absolute and utter law — the antlike formians — it is hardly surprising some forgotten demon lord, long since deposed, created his own laughable imitations of them, insectlike beings which were utterly without true order, yet who were compelled to exist in a cruel parody of a formian’s ordered hive. These demons, sometimes called demon ants, unformians, or chaos bugs, have occasionally appeared across the multiverse in plagues of violent destruction. They have pockets on many planes on the abyss, having spread rapidly, but at least one such home has become something different. The hive on the plane called Azgrah covers most of the surface, which was once a savannah infested with something best described as hyena-centaur gnolls. When the demon ants came, there was a long period of war, but, slowly, the insects took control of the plane, and their tunnels spread above and below the surface. If the demon lord of gnolls took notice, he took no action. Recently, the hive itself has begun to change. The dirt tunels have become covered, in part, with metal plates, with pipes and tubes and ducts. The demon-ants themselves, never particularly symmetrical or orderly, have become even more distorted, as their bodies erupt in dark armor plates, their limbs are replaced with mechanical pincers and extenders, and curious devices of tarnished metal appear on heads and torsos. The plague (see here for mechanics and details) has spread throughout the hive, though there are a few isolated sections which remain "pure" and which seek to battle their infected kin. The layer, until recently a minor footnote to scholars of the Abyss, has recently attracted scholars and adventurers, who spend as much time battling each other as they do the inhabitants of the layer. Artificers, as one might guess, are particularly drawn to his place. The demon-ants have always had a give for linking their hives with places in the mortal realm, and this gift has not been lost to the plague. There are several known points of infestation, places where mines, tunnels, or cave systems on mortal worlds connect back to this plane of the Abyss. The links are currently small and unstable, but the fear of a possible invasion is both great and justified. Such an invasion usually involves a breach, followed by a swarm of the most mindless and vicious of the demon-ants. Once they have established a territory, stronger and smarter bugs follow, and begin to breed, producing a seemingly endless variety of distorted creatures. Unless the breach occurred in a well traveled spot, by the time anyone is aware of the invasion, a hive is well underway. The interior of such a hive, either in an invaded world or on some plane of the Abyss, is twisted. Tunnels branch and split randomly, pits open to untold depths, and tiny passages too small for any of the inhabitants to pass through lead to vast open chambers. In the Abyss, gravity, temperature, and light are random as one works through the hive. The great thing about the demon ants/unformians is that they are, by definition, strange and random. There’s no need to justify the existence of any particular sub-breed or type, or worry if there’s more than one of a given strange variant; they produce almost anything conceivable, and with the addition of the Machine Plague, it’s only become worse. Ranging in intelligence from animal to superhuman, and not necessarily bound by the strictures of the hive, the remnants of a stopped invasion could be anywhere on the world. As a rule, the demon ants are very, very, roughly "ant-like". Any variation in appearance should be "Like an ant, but…" For example, "but with eight legs, and eyes on long stalks, and rows of tiny mouths lining the torso" or "but with a human head growing out of its back" or "but with octopus-like tentacles where its feelers should be". To make use of the Clockwork Hive, add in random armor plates, sparking electrical devices, and steampunk prosthetics. The most common unformian, the biters are nearly mindless creatures that swarm over foes, destroying them by sheer numbers. At least one variety of Clockwork Biter has grown iron plates across much of its body. These plates tend to fall off when struck, but they can deflect what would otherwise have been a killing blow. And if I don’t post this in the next few minutes, I miss my "Plane a Day" window. 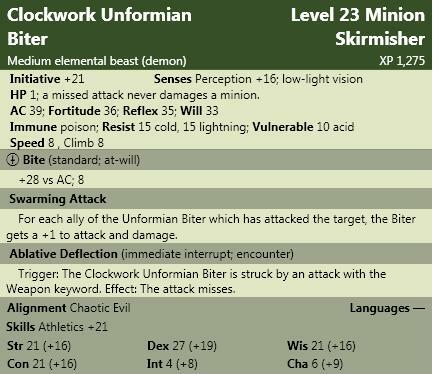 🙂 So look for more Unformians sometime next week; I’ve got a bunch of ideas for them, and the Machine Plague, and I want to develop them in more detail.